The State Emblem of India is in adaptation from the Sarnath Lion, capital of Ashoka the Emperor as preserved in the Sarnath Museum. 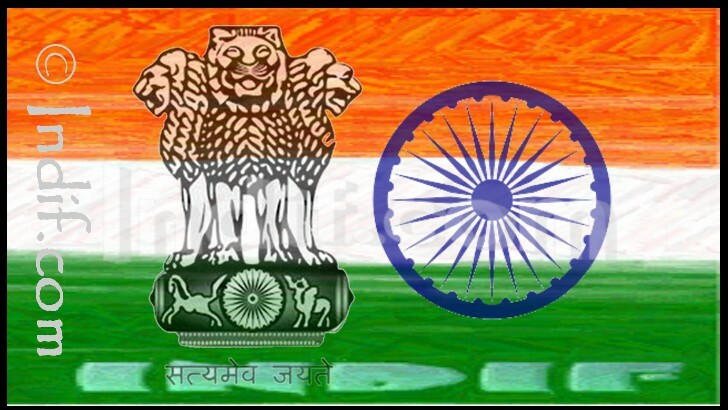 The government adopted the emblem on 26th January, 1950, the day when India became republic. The National Emblem is used only for official purposes and commands the highest respect and loyalty. In the original Sarnath capital, there are four lions, standing back to back, mounted on an abacus with a frieze carrying sculptures in high relief of an elephant, a galloping horse, a bull and a lion separateIn the original Sarnath capital, there are four lions, standing back to back, mounted on an abacus with a frieze carrying sculptures in high relief of an elephant, a galloping horse, a bull and a lion separated by intervening wheels over a bell-shaped lotus. Carved out of a single block of polished sandstone, the capital is crowned by the Wheel of the Law (Dharma Chakra). In the state emblem adopted by the government of India, only three Lions are visible, the fourth being hidden from view. The wheel appears in relief in the center of the abacus with a bull on the right and a horse on the left. The bell-shaped lotus has been omitted. The words Satyameva Jayate from Mundaka Upanishad, meaning Truth Alone Triumphs, are inscribed below the abacus in Devanagari script. The emblem forms a part of the official letterhead of the Government of India, and appears on all Indian currency as well. It also sometimes functions as the national emblem of India in many places and appears prominently on the diplomatic and national Passport of the Republic of India.